Start the holiday Season ELECTRIC! “The Season Electric 2018” is the ultimate family Christmas music concert! This special version of The Nu Wavers concert will benefit the Aloha High School band program. 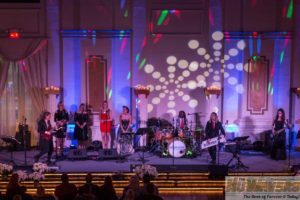 With a few special guests, they will share their love of the holiday songbook (including favorites like Mannheim Steamroller and Trans Siberian Orchestra) and along with some festive surprises! Tickets are $12 in advance (available through TicketTomato.com) or $15 at the door. The NU WAVERS perform the most complete set of music from Forever and Today! The NU WAVERS play your Favorites, College Radio Classics and Alternative gems! With five distinct singers The Nu Wavers capture the diversity of some of the most memorable eras in pop culture! Read more about them here. We are so excited about this concert — the NuWavers are great musicians AND they are donating their performance so that ALL proceeds will support the instrumental music program at Aloha. Support Aloha's instrumental music program with a tax-deductible donation!